Most of the End of the season Team parties that I've been to have been pretty boring overall. The format is usually to get together, have a potluck dinner, and then give out awards. It works. But it's usually pretty boring. Plus, one of the things I hate at potluck parties is trying to juggle your plate, your silverware (why do they always put that at the beginning of the buffet line? ), and your food. 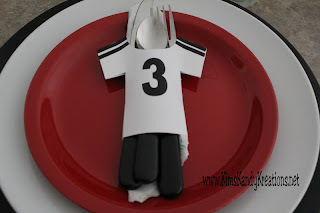 In an effort to help with the juggle and to spice up the party just a little, I created these fun Soccer jersey silverware holders. These allow you to place all the silverware and the napkin in an easy "pouch" that will keep them together while gathering your food. Or better yet, place them at the END of the food table and allow your guests to grab as they are leaving. They are simple to print out on card stock. Each jersey has a front and a back. The jerseys are 4 inches by 4 inches with a 2 inch wide shirt base. Cut out the jerseys around the outline. The front jersey shirt hole is designed that you can use a 2 inch hole punch if you line it up. Now it's easy to add your silverware and napkin through the top and bottom holes. You can get the jersey with the white and black lines in our shop HERE. We'll be adding more designs soon. If you want us to try and make your jersey, just drop me a line! Plus, something I hate with potluck celebrations is wanting to be able to handle your own dish, your current cutlery (exactly why do that they always set which at the start of the food collection? ), as well as your food. To help help with the particular accommodate and also to enhance your get together slightly, We made these enjoyable Baseball jacket cutlery cases. These kind of permit you to position all the cutlery along with the serviette in a easy "pouch" that may you can keep them together although collecting the food. Or also, stick them after the meals kitchen table and invite your friends and relatives to grab because they are making.